File photo of a dog wearing a shock collar. IRISH AUTHORITIES ARE facing calls to ban collars which use small electric shocks to train dogs. The Scottish government has moved to ban the devices, known as shock collars, after animal charities expressed concern over the harm they may cause to animals, BBC News reports. They are already banned in Wales. A shock collar is a form of negative reinforcement training used on dogs where a device attached to the collar delivers a small electric impulse into the dogs skin to assist in training. Some are capable of geofencing a dogs location, training them not to go beyond a set boundary. 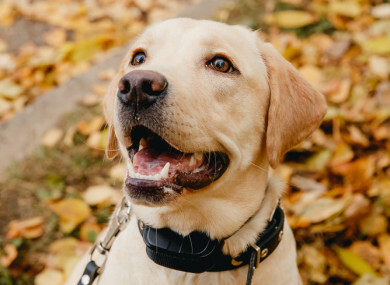 Research generally points towards the devices having some use in training dogs, although positive reinforcement methods are likely to have a similar outcome, and that the reckless or incorrect use of a shock collar will cause the dog distress. The Irish Society for the Protection of Cruelty to Animals (ISPCA) is calling for the Irish government to follow in the footsteps of its Welsh and Scottish counterparts. “The ISPCA is opposed to the use of any training method that may cause unnecessary and call on the Irish government to introduce a ban on the use of electric collars in Ireland too,” the organisation said in a statement. In addition we would like to see a ban introduced on the use of other negative reinforcement (aversive) training methods such as prong collars, choke chains, citrus sprays and high pitched sonic devices all of which may cause unnecessary suffering and distress. These training techniques can cause pain, fear or distress and may result in poor welfare. The collars are available to purchase some some pet supply retailers in Ireland, while others have removed them from their shelves. MaxiZoo describes shock collars as “not dangerous for dogs”, but does not stock them, opting instead for ‘spray collars’ – these spray a mildly unpleasant liquid at the dog’s mouth instead of an electric shock. The Irish Kennel Club (IKC), an organisation which promotes responsible breeding and ownership of dogs, already imposes sanctions on members if they are found to be using shock collars. “We would be totally against them,” IKC president Sean Delmar told TheJournal.ie. If you have to use a shock collar, you’re not able to train a dog, you do not understand dogs, end of story. The only thing dogs want to is please, anyone who has had a dog knows that, that’s why their relationships with humans is so successful and has evolved into uses like guide dogs, working dogs, drug dogs. Delmar added that if a member is found to be using a shock collar to train a dog, a ‘yellow card’ sanction can be imposed. If they do not stop using the device, they can be expelled from the IKC. He explained that some other negative reinforcement methods do have some limited value, citing how a choke collar – a collar which tightens if a dog pulls excessively on a lead – can be useful in controlling a dog, but stressed that any excessive use that caused harm to the dog would cause it to fall under the same category as a shock collar. In responses to queries from TheJournal.ie, the Department of Agriculture, Food, and the Marine – which oversees animal welfare legislation – highlighted that “the use of electrical or other such equipment which can apply a sustained electric current or impulse directly to a live animal” is banned. However, due to the nature of training devices, they do not fall under this legislation. “However, those in control of animals have strict responsibilities under the Animal Health and Welfare Act 2013 and must not do, or fail to do, anything which causes unnecessary suffering to any animal in their control. Any such action, or inaction, is an offense under the Act,” the Department’s statement added. Email “'If you have to use a shock collar, you don't know how to train a dog - end of story'”. Feedback on “'If you have to use a shock collar, you don't know how to train a dog - end of story'”.